The Travellers Aid buggy service at the Seymour station and has celebrated its third birthday. The buggy service commenced operations in September 2014 and since then has provided assistance to scores of travellers with limited mobility. The buggy operates five days a week (Monday to Friday) between 10am and 6.30pm, and assist customers with transfers from train to bus. The service is handy for seniors, people with disability and mobility issues and other people who require assistance moving between the bus stop, the taxi rank and the platforms at Seymour Station. The service must be booked in advance to ensure someone meets the traveller at the train, bus or taxi platform. Buggy coordinator, Margaret Canny, said that the service is seeking active locals who want to become more involved with the local community. “The buggy driver plays a very important role helping people who may not be confident moving about an active train station. We train volunteers to accompany regional travellers around the station helping them on and off the buggy and driving the buggy. 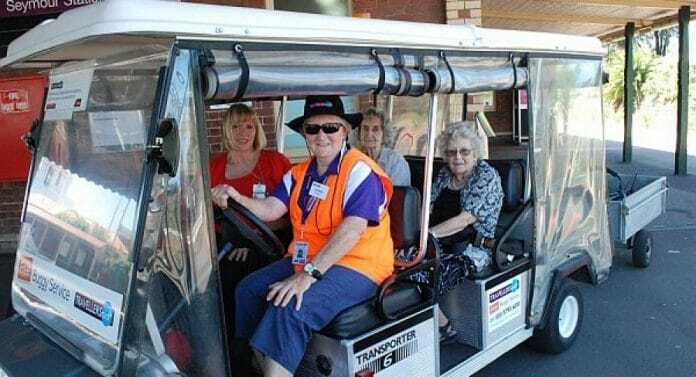 At Seymour Station, we provide free buggy transport services and personal guidance services for people who have vision impairments,” Ms Canny added. The service operates in partnership with V/Line.